My sister is a huge WoW nerd and has recently acquired a new home with blank walls, so I decided that a house warming gift was in order. 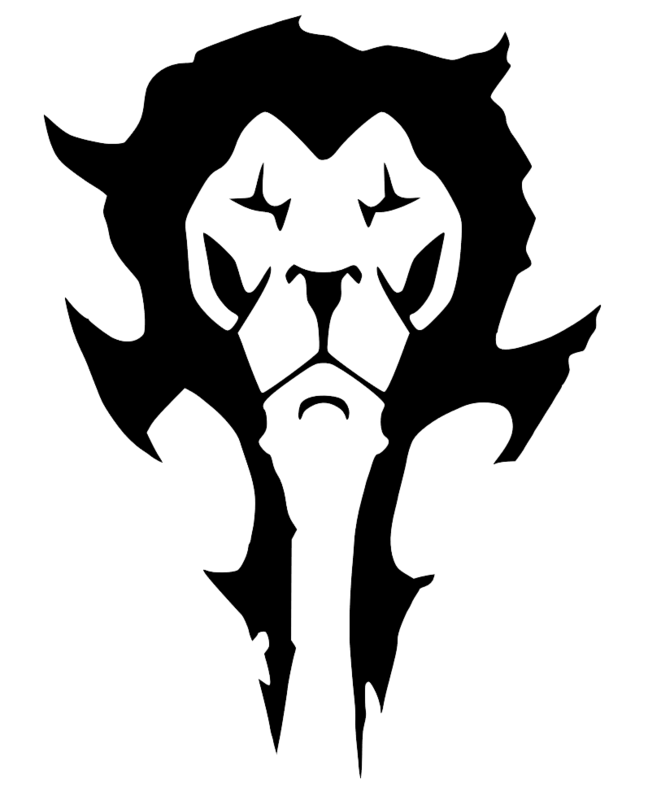 First I found a Horde/Alliance mashup image from /u/deathonabun that I downloaded and converted to an SVG for laser engraving. 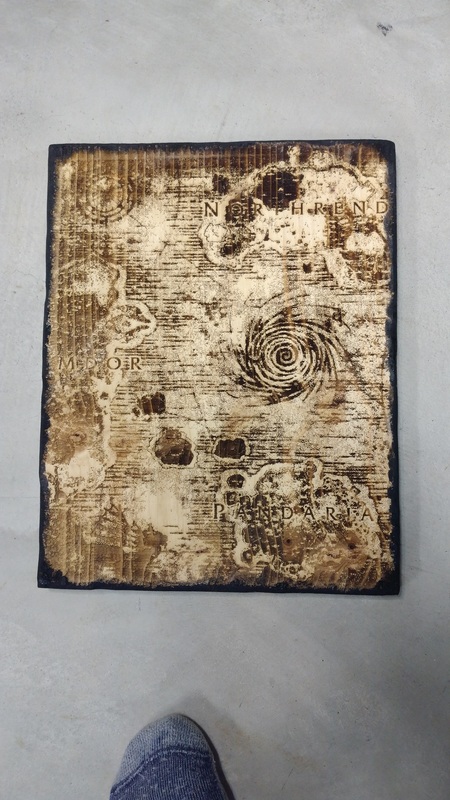 I wanted this to be a wall hanging so I got ahold of a JPG of Azeroth that I converted to a grayscale, again for lasering. I went with gray scale because I wanted the pine wood that I was using to get a lot of heat to help make it look old. 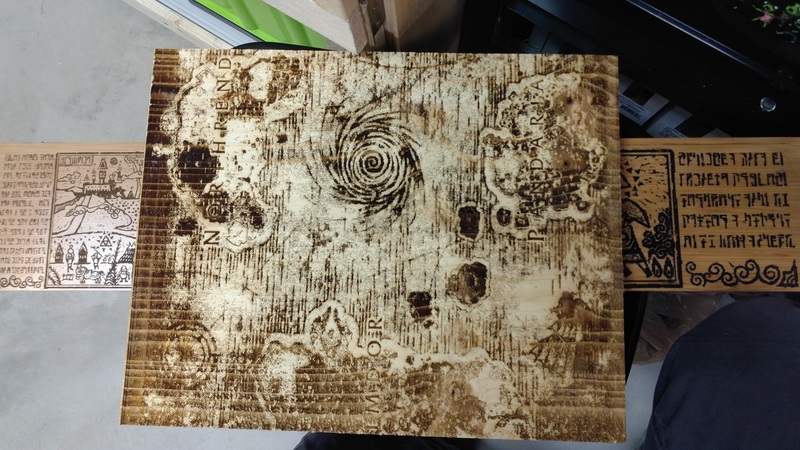 No pictures of the wood before hitting the laser, so imagine wood. Good job. I just used a cheap 3/4 inch thick pine board and a really cheap 1/4 inch thick luan board for the symbol. The laser made really short work of the pine, but I went ahead and did 3 passes to get the cuts nice and deep to really make the map pop. The symbol I burned all to hell to get as much texture on it as I could. The map I didn’t need to do much work on. I took an orbital sander and used it to chew up the edges in an uneven fashion. I then took some black paint and painted what I thought looked like burn marks around the edges and onto some of the face. 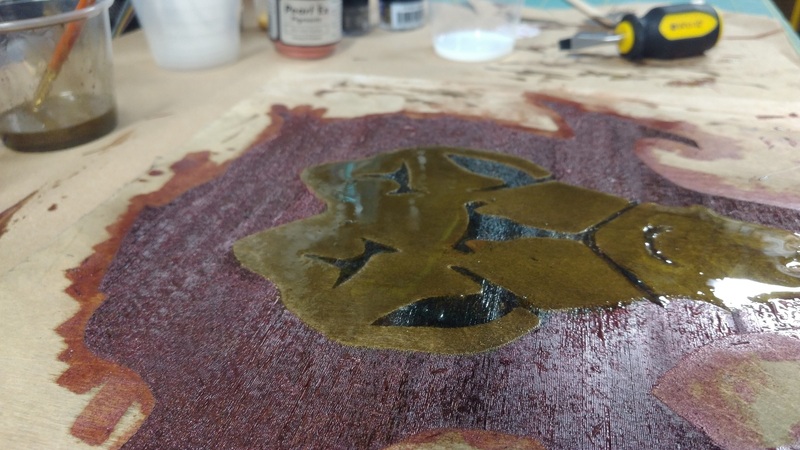 I wanted to use epoxy instead of paint on the symbol itself because I had this idea of using metal infusions to help make it pop. 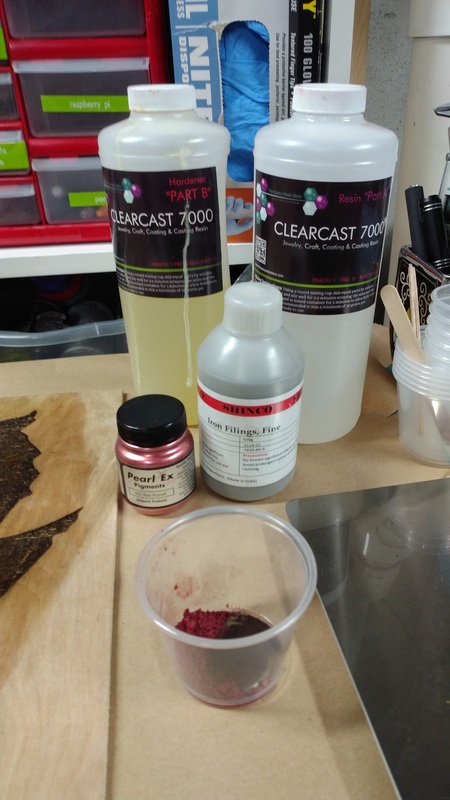 I took some ClearCast 7000, some red dye, iron fillings and some brass powder and mixed up two different batches of epoxy, one with red and iron and the other with brass and iron. I’m using the iron because I want this piece to age over time and few things say old better than rust. 7000 fortunately has a few hours of pot life so I wasn’t in a huge rush here. 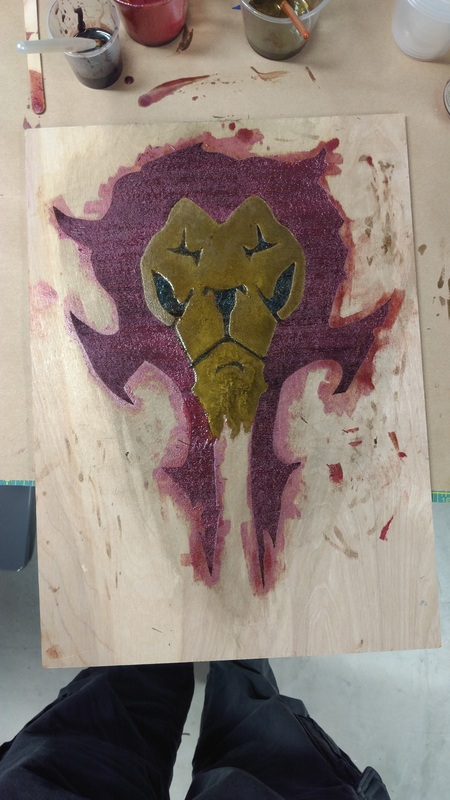 First I applied the red color to the horde symbol. I didn’t have to be very careful here because the laser did a good job of cutting into the wood so I have some natural walls that the epoxy won’t flow over and any overflow will be taken out with the saw anyway. 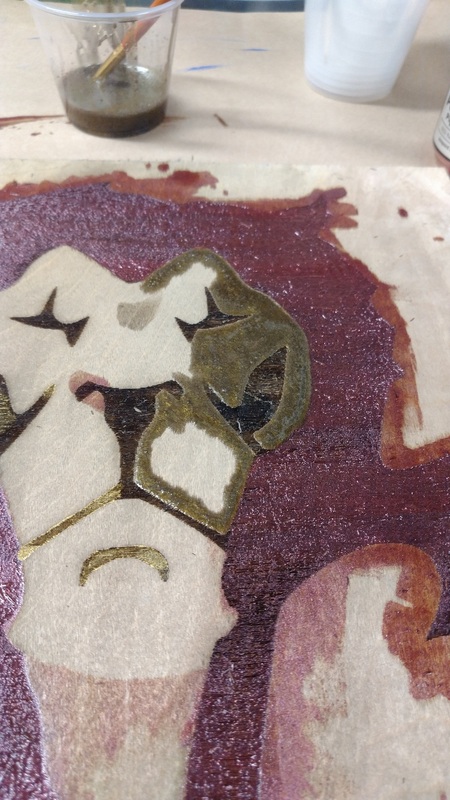 The brass on the other hand was way trickier and I had to dab it onto the non lasered parts of the wood with a very tiny paint brush, one drop at a time. The end result though is that the horde side is recessed, textured and worn looking while the Alliance is raised, smooth as glass and super reflective. 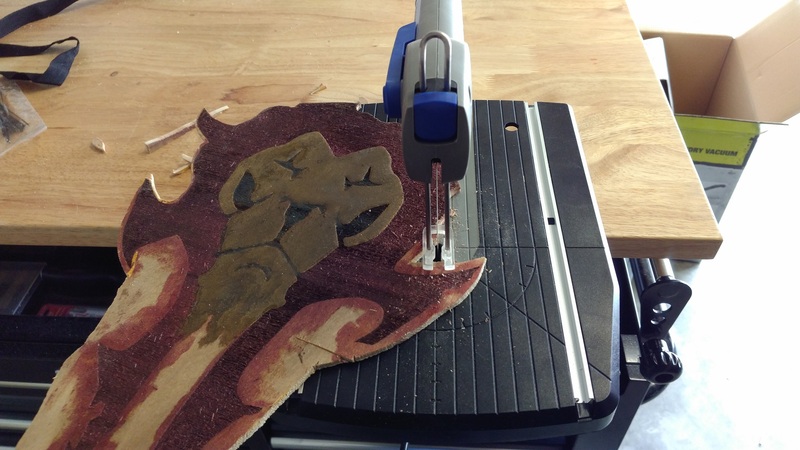 I did a quick rough cut and gave it a look before I went through the hell that is a scroll saw on 1/4 luan. Of all of the parts of this project, cutting out the symbol is what worried me the most. This wood splintered if you just looked at it for too long and while the epoxy provided a lot of extra strength, the opportunity for failure was high. That and I’ve never used a scroll saw. As luck would have it, I only sawed off the parts I didn’t need and was able to get this dude hotglued onto the map about an hour after taking it to the saw. 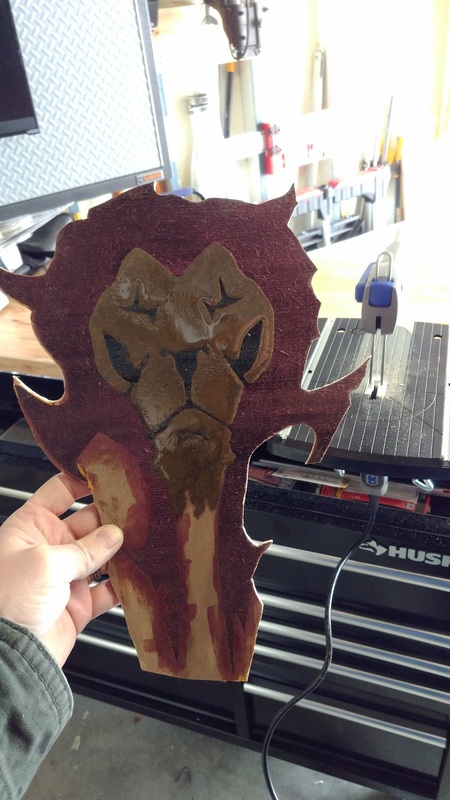 All in, I spent about $8 on wood, 2 hours on the laser and 10 hours in painting/cutting/cursing.